Dental crowns and bridges fit over injured, discolored, or cracked teeth or replace missing teeth. Crowns (caps) are used to restore teeth that are broken or are questionable due to large fillings or fractures. Crowns blend seamlessly with your teeth, return the strength that you need for comfortable oral function, and maintain your all-white smile. There are a variety of materials used to design these reconstructions in laboratories. Crowns are usually either made of noble alloys, or porcelain. 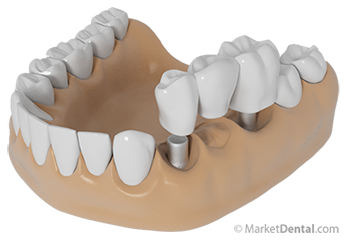 There are many different types of porcelain crowns and we will determine which type is best suited for your particular need. During your first visit, we will prepare your tooth structure, take an impression of the prepared tooth, make a temporary crown to place on the tooth, and then send the impression to a dental laboratory to fabricate the crown. At your next visit, we will try-in the crown to ensure a good fit and cement the crown in place. Bridges are fixed, or non-removable prosthesis constructed to replace one or more missing teeth. The teeth on both sides of the existing space are used to attach the bridge to restore functionality and esthetics. Materials used for this process are noble alloys, porcelain or porcelain fused to metal. Bridges are indicated whenever at least one tooth is missing.